Here are a couple of mysteries. 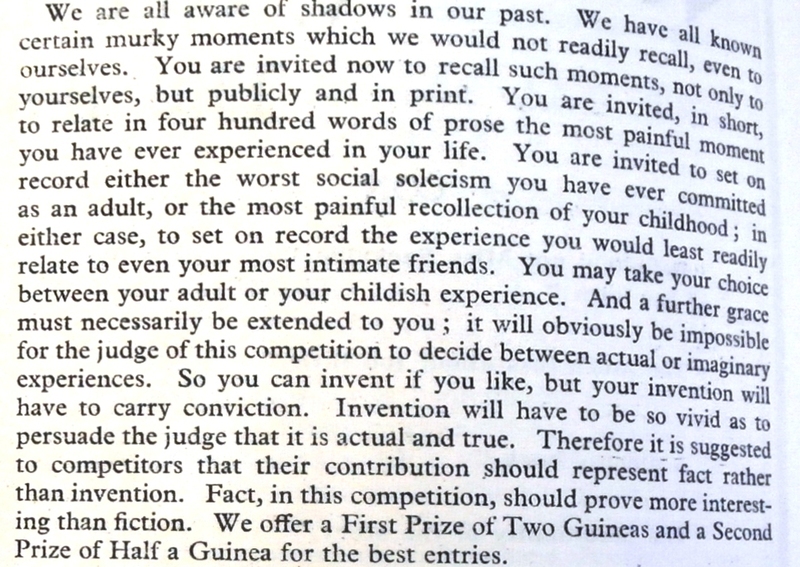 Why does Elizabeth Bibesco say that it is unusual for ‘Gordon Daviot’ (the alternative pseudonym of ‘Josephine Tey’) to miss a competition, implying ‘he’ i.e. 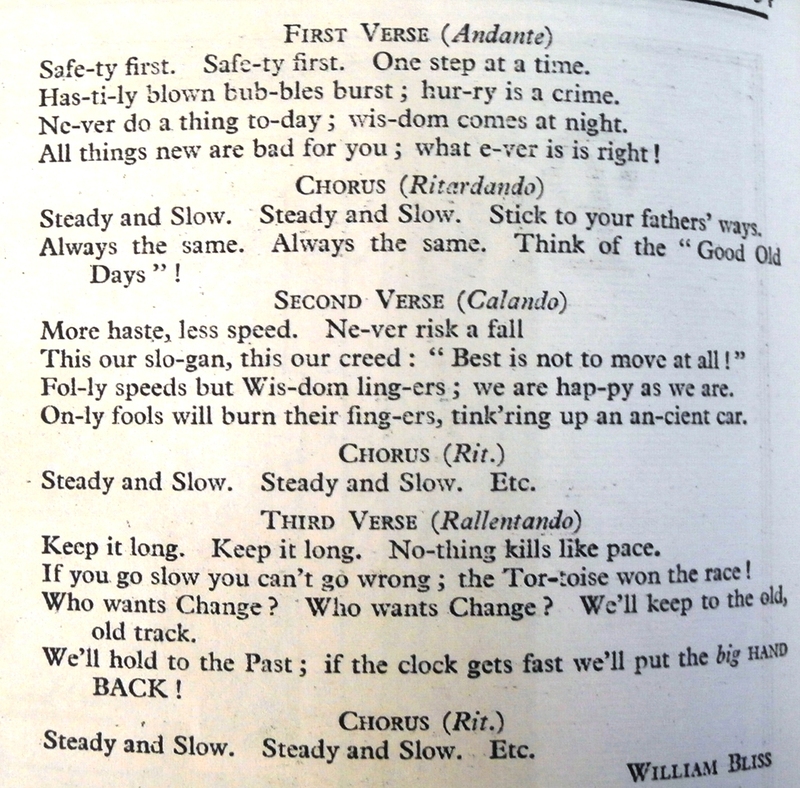 Tey is a regular, in 1933, when ‘he’ only appears once, in 1930 (does anyone know if Tey had other pseudonyms)? Who was Dorothy Avery, the judge in early 1933 (I’m completely stumped)? Why does Seacape seem to vanish and reappear as Black Gnat? The 1932 and 1933 honours boards are now complete. One new feature contains extracts from The Saturday Review before and after Gerald Barry left it to found The Week-end Review.There is also an article on the takeover. You can find them under History. Another new feature: I have managed to obtain about half the copies of the WR at a knockdown price (they turn out to be the former property of the WR’s business correspondent), and this makes it much easier to use some invaluable source material. Many competitors wrote to the WR (not just about competitions); I therefore know (for instance) that Mariamne was a librarian. In due course I will try to beef up the more accessible individual biographies. One that I am starting to expand is that of William Bliss, who was competing right up to his accidental death in his 80s. To search for an individual competition, type the digit and A i.e. 1A into any tag search: so Competition no. 1 (actually they used Roman numerals for the first two years) will come up when you search on 1A. (It doesn’t seem to like 0001, but I’m working on the tagging.) The blog gives the results. Early competitions are listed on The Competitions page. You can link back and forth, although I have left completing this task for later at the moment. As with all blogs, the entries will be the most recent, first. However, I’m going to make this one a ‘sticky’, so that it stays at the top. Remember that this is a work in progress! This one is every judge’s nightmare. 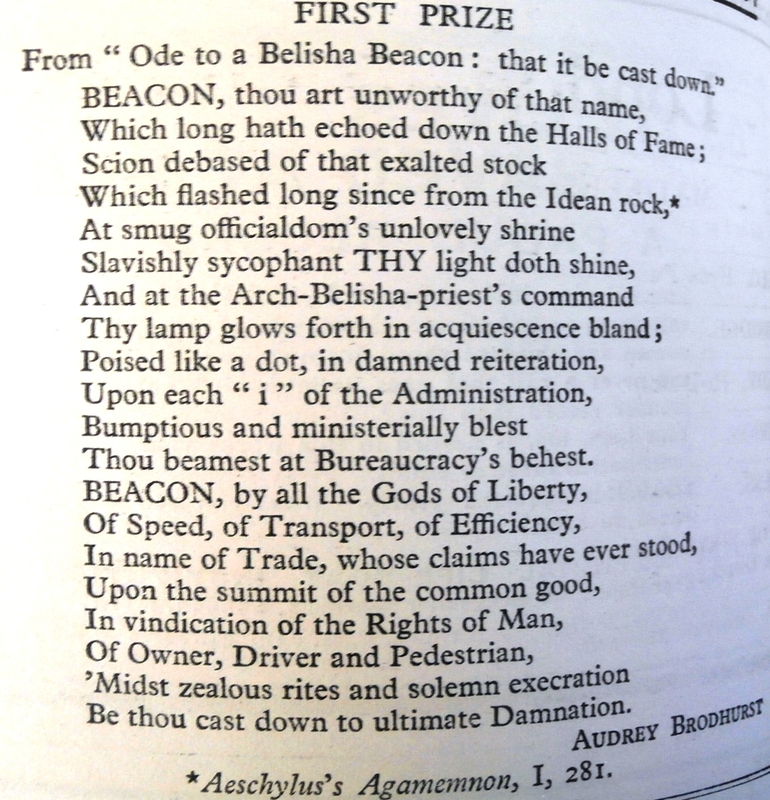 On the same theme as 243, Gerald Barry, no less, asks for (a fragment of) an ode on the subject of Belisha beacons – ‘Ode to a Belisha beacon: that it be not cast down’, from which we get the information that they were much-mocked. But a slip in the process of getting the NS&N type-set has meant that the word ‘not’ had been omitted. 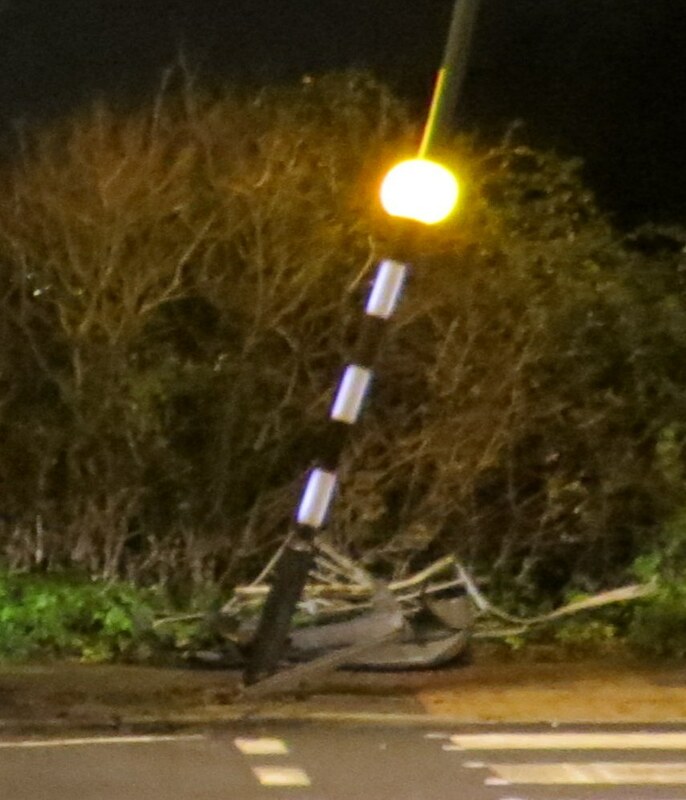 Various familiar compers have set about an onslaught on the Belisha beacon, with only one or two spotting (and apparently with feeble results) that the opposite was intended (‘a sorry crop of the facetiously forcibe-feeble’). It is to Barry’s credit that he gets an entertaining few paragraphs out of the debacle. 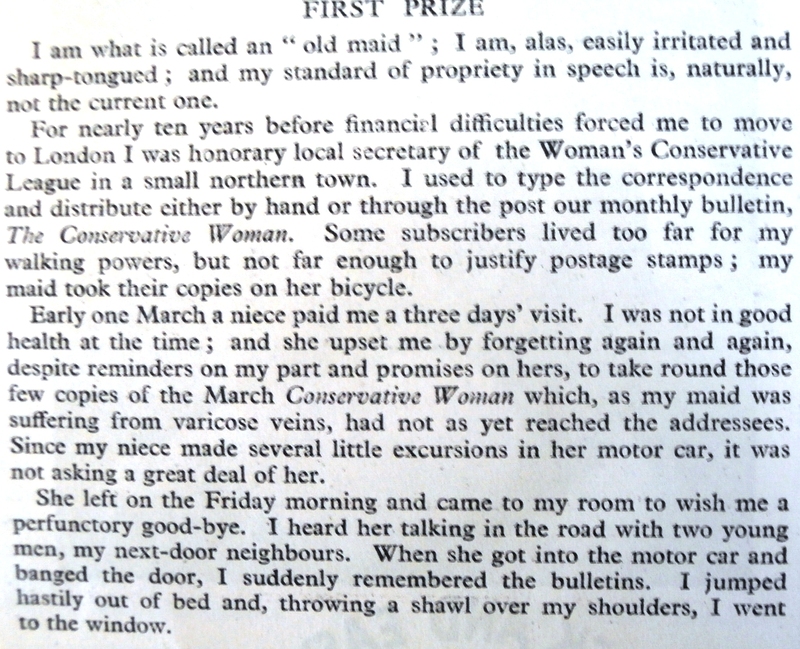 However, in batting away William Bliss, Lester Ralph, Allan M. Laing, Guy Hadley, W. Summers and Marion Peacock, and cancelling the second prize, Barry does select a winner: Audrey Brodhurst. Audrey Cecilia Brodhurst was born in Birmingham (Harborne) in 1912, and died in Islington in 2005. 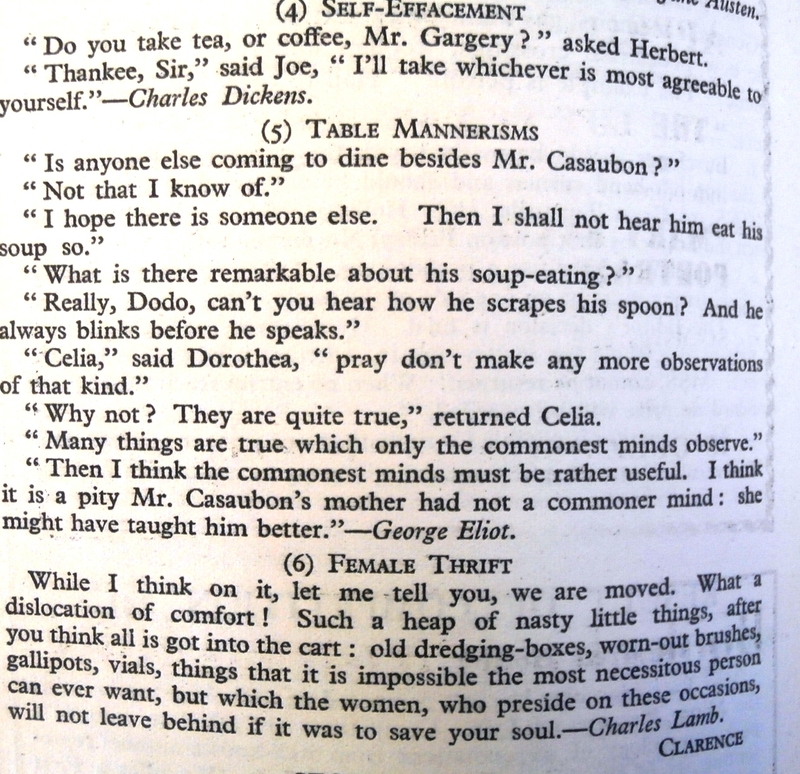 She went to Oxford (Somerville) in 1930 or 1931, and Somerville has a manuscript which I assume covers or includes material on being a woman and an Oxford student (it is used as source material by Jane Robinson for her book ‘Bluestockings’). She seem to have been a historian with a special interest in revolutionary France. Her father was a civil servant in Birmingham. In the 1950s and 1960s she lived in very select Dolphin Square. Another find-a-quotation competition. 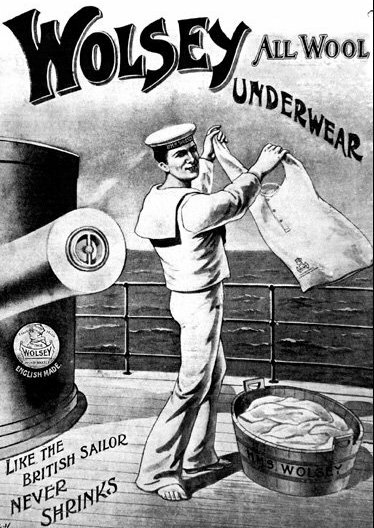 V.S.Pritchett asks for one-line quotations that could be used to advertise the following: bread;wireless valves; beer; lipstick; a General’s memoirs; gas-masks; meat extract; a perfume; a cruise; the new pedestrian crossings (these were Belisha beacons, plus parallel studs, and had been introduced in July 1934. 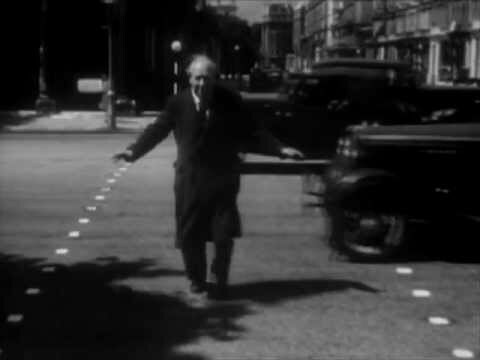 Zebra crossings are post-war (1951). I bet there are many films that get this wrong); woollen underwear; the telephone. The example given is petrol (‘Hail to thee, Blithe Sprit’). 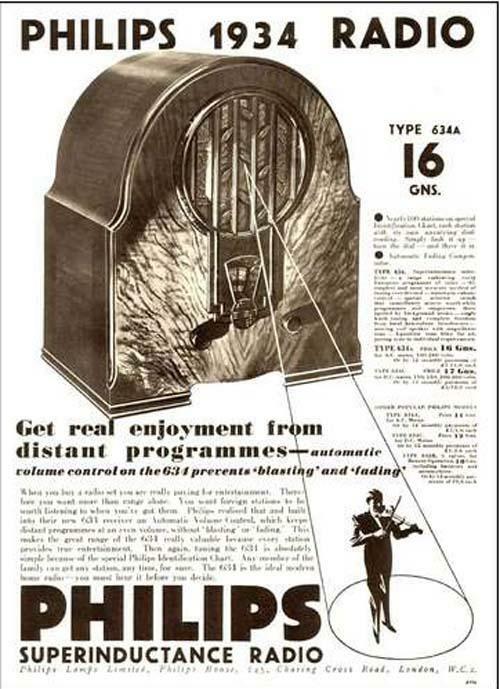 Here is a 1948, pre-zebra, information film that shows the crossings, and here’s a still from it: 1930s adverts so we can check? (Most are from 1934 itself.) 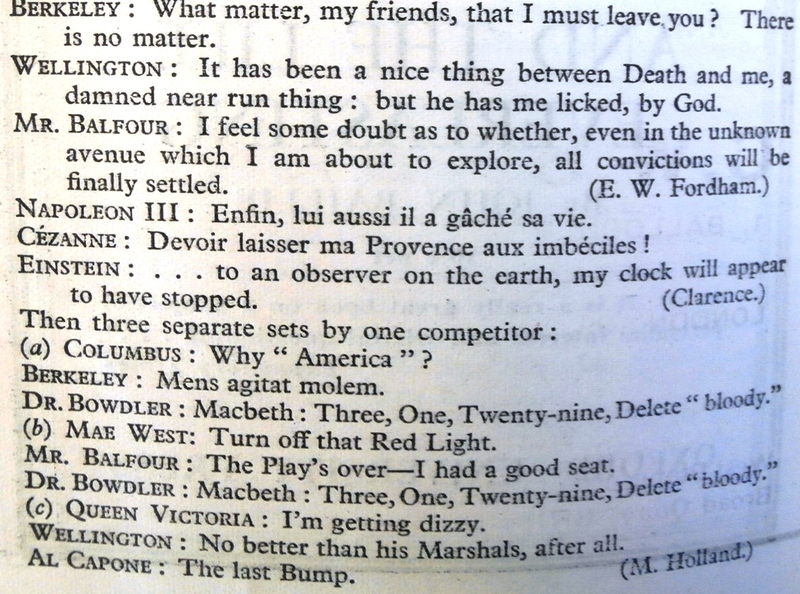 Pritchett has underestimated the extent of the page-turning of dictionaries of quotations that entrants are unafraid to do. He gets a large postbag, and his job is not helped by the fact that most entrants have one or two good ones, but not a full hand. Many entrants used the same dictionary. Lots of them used Rupert Brooke’s Heaven for beer: One may not doubt that, somehow, Good Shall come of Water and of Mud; And, sure, the reverent eye must see A Purpose in Liquidity. We darkly know, by Faith we cry, The future is not Wholly Dry. Pritchett offers a short selection of near-misses: Still dubious about Wolsey? 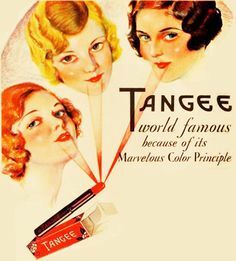 Here’s a contemporary ad: And this brings me to the winning entries. A.S. Gray and Anthony S. Watson come close. The result, says Pritchett, was almost awkward: hard to judge between the witty and the wittier. Jointly heading the pack with Alphamu (they split the first prize), and 24 years of age, is a name new to the competitions: Angela Milne. Angela (Mary) Milne was the daughter of Kenneth Milne, a senior civil servant who had given up his work through illness in 1926, and had died in 1929. 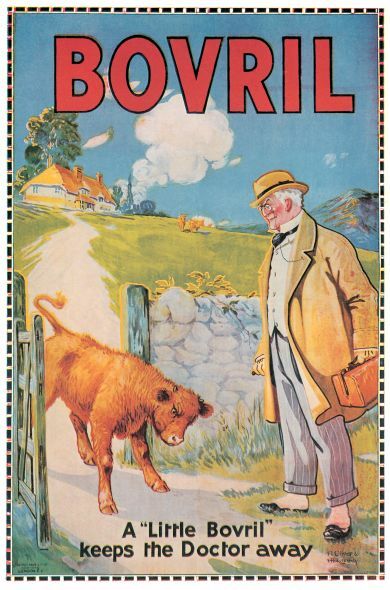 Kenneth Milne had been admired by his brother, A.A. Milne (a third brother, Barry, was loathed). 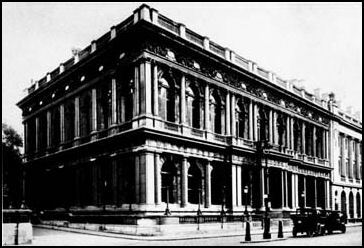 After Kenneth Milne died, AAM took over the organisation of the family he left – a widow and four children, of whom Angela (born in 1909) was the second (the third was Ian Innes ‘Tim’ Milne, a section head after the Second World War at MI5, thanks to Kim Philby). 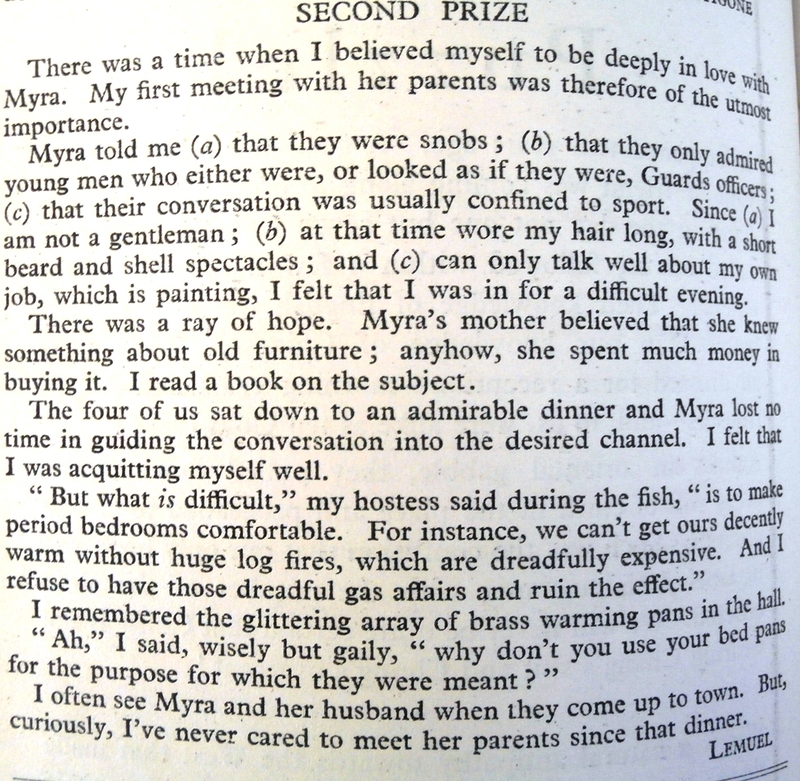 At the time Angela won this competition, AAM had spent the first of four summers with Angela’s mother and her family in Dorset, while his wife travelled elsewhere. 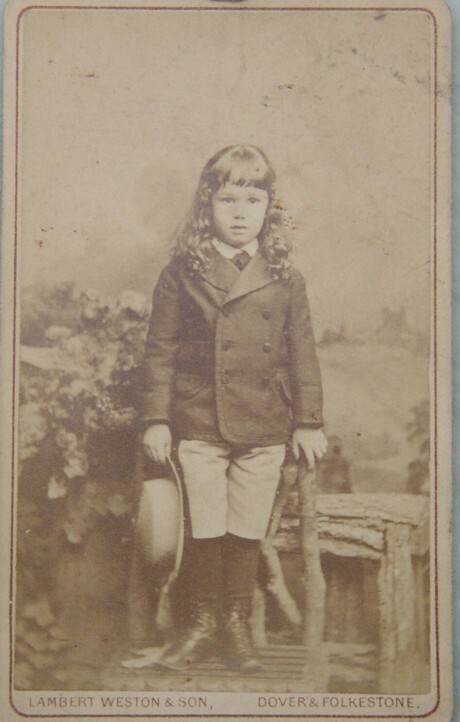 He was also by this time writing for Punch, and Angela followed him there (her father Kenneth had also briefly been given work by AAM at Punch). 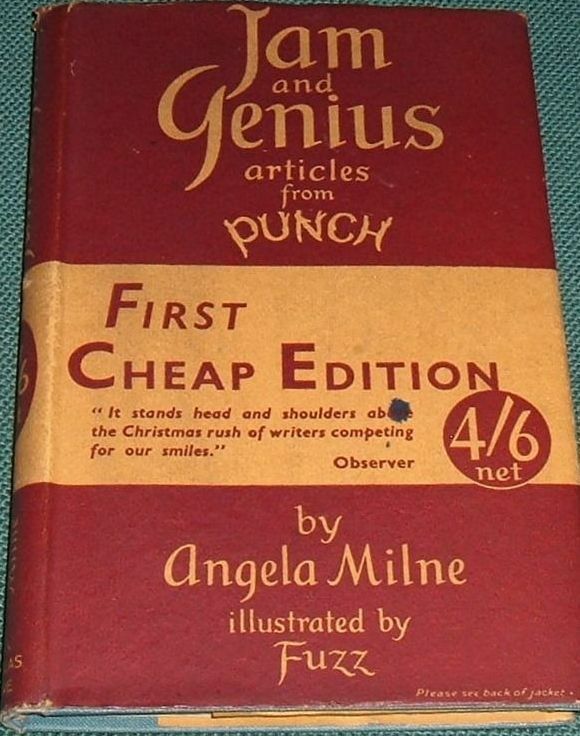 Angela Milne was one of the most highly regarded Punch contributors (she turns up repeatedly in Pick of Punch from the forties onwards, and she also wrote as ‘Ande’. She was a regular contributor to London-based magazines until the 1980s), and she was also valued as a reviewer (she reviewed for The Observer). She was still publishing humorous books in her seventies. 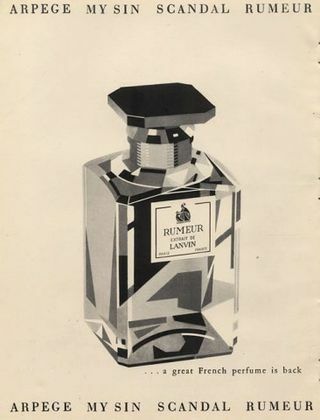 At least two collections of her Punch pieces came out, of which the better-selling one was Jam and Genius, published in 1948, a year before she married Reginald Killey. She had a daughter, Mary (not yet sure if she married twice) and a son, Nigel Killey, in 1949, and she died in 1990 in Hampshire. The runner-up is another new name, Calluna. Francis Ledwidge, incidentally, whose name is not well-known, was a poet – from Ireland – killed in World War 1 at Passchendaele in 1917, when he was days away from turning 30. 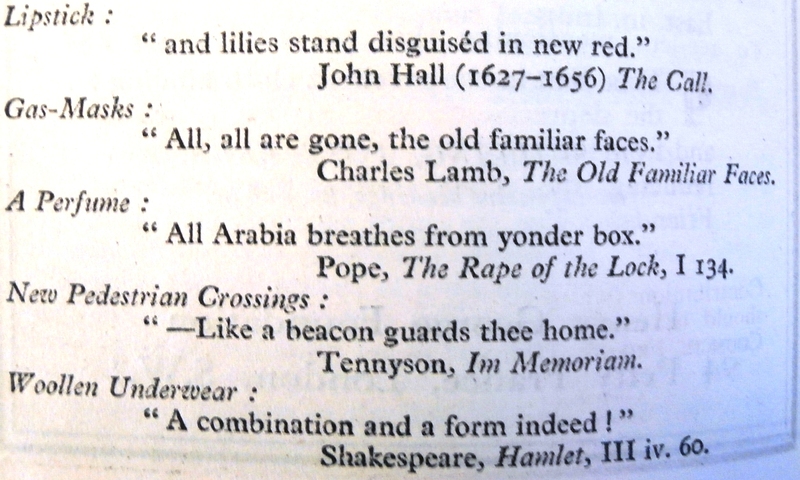 Three poems appeared in Marsh’s Georgian Poetry. His age and his Irish nationality are unusual in this context. His last collection of poems is here. VSW says the competition is easy to judge, the easiest ever, because nearly all the entries misunderstand or ignore the task, and send in when they have been most frightened. Surely the instructions were clear, she says. Yes, but ‘the most painful moment’ is probably the phrase that has sent competitors astray, although they had to work hard to miss ‘social solecism’. Four hundred words! It does seem a luxury. 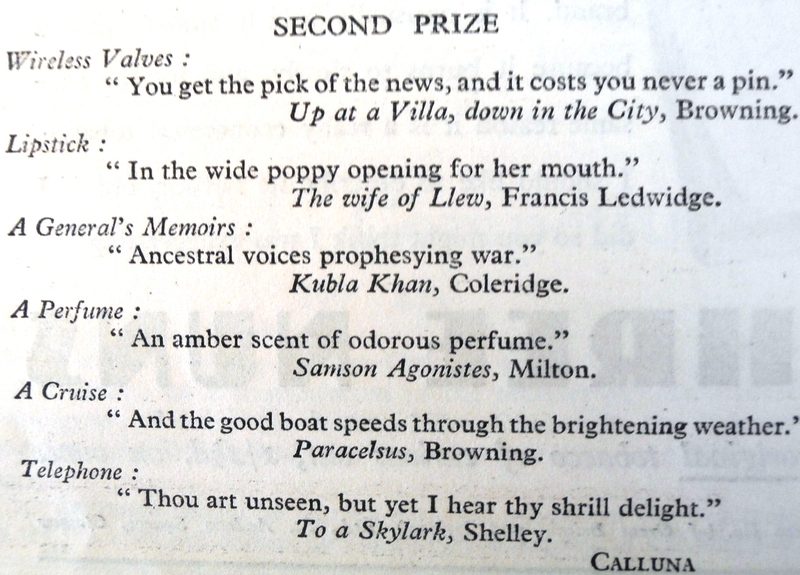 Both the prizewinners are new winners, and that might well suggest that they are telling the truth. Three others are mentioned – Agatgha (not very funny story about a mannequin on a mantelpiece; the Rev. 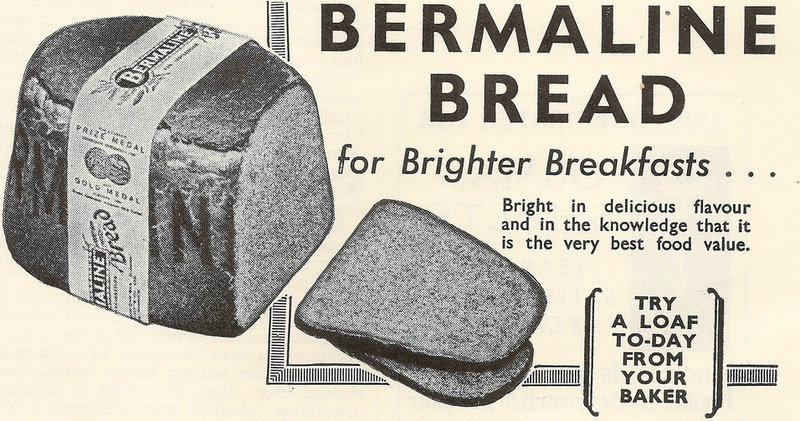 A. Ferguson, who once mixed up a fish-cake and a bread-roll (the worst solecism? ); and William Bliss, whose improving story about a Jesuit father is so good that VSW says he could get more than two guineas elsewhere (Yes, but …). The winners (and I like them both) are Antigone and Lemuel. Antigone offers an interesting insight into the kind of people who were amongst New Statesman and Nation‘s readers. 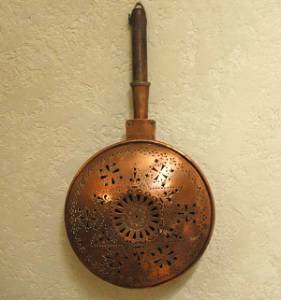 There are plenty of adverts on eBay for what should be -warmers, but are shown as -pans. 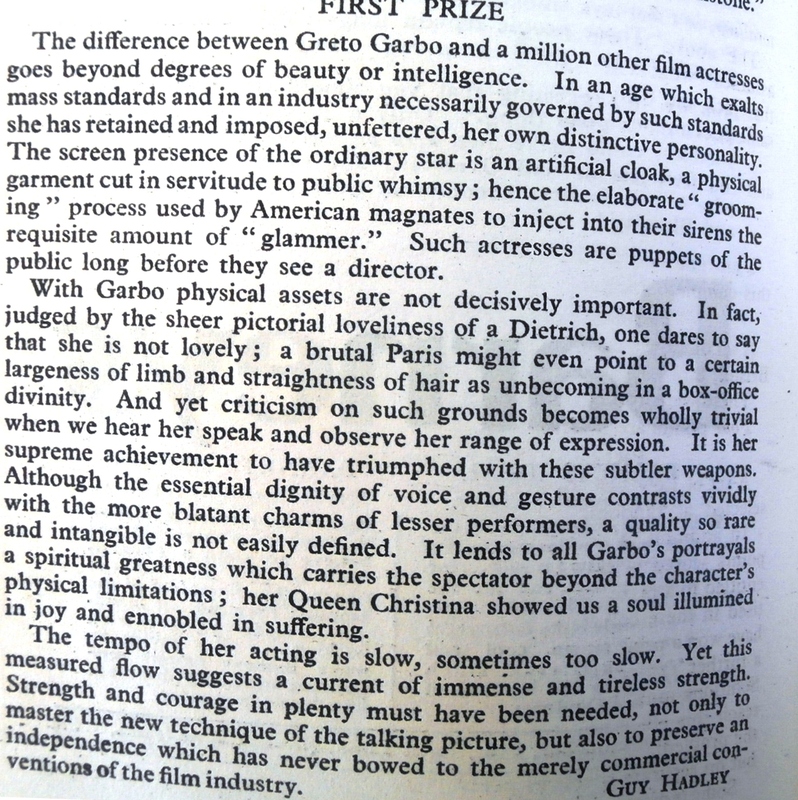 Winifred Holtby sets this competition (further evidence, perhaps, that the competition allows us to see across the literary left). She was a reviewer for Time and Tide and The Bookman, but this is a very conservative competition. 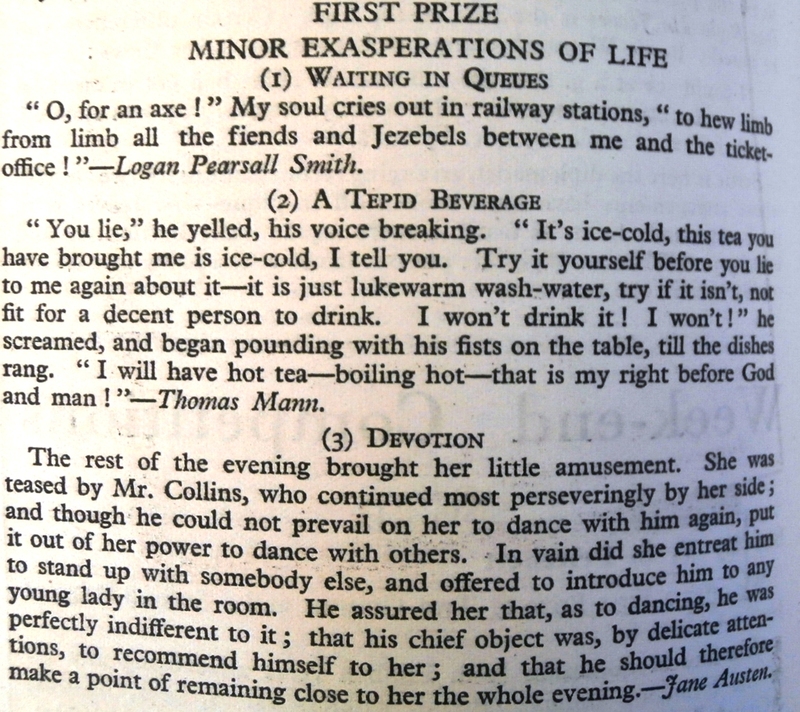 Rose Macaulay had just published an anthology called The Minor Pleasures of Life (there were a lot of them – there are over 600 pages of text). 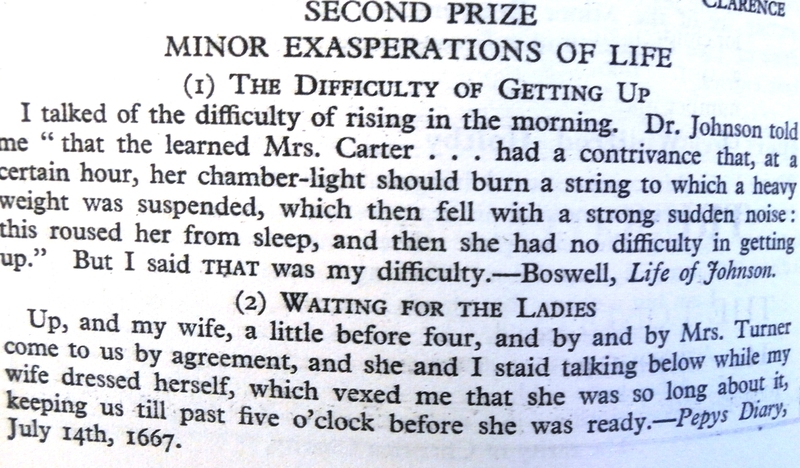 Holtby asks for six extracts to go with the title The Minor Exasperations of Life (apart from the need to mirror Macaulay’s book, I think exasperations are automatically Minor). However, competitors seem to stretch the idea of exasperation to the limit. Redling pops up with a verse from Hardy’s The Dead Man Walking and James Hall offers the opening of Ode to a Nightingale. As Holtby says, hardly exasperation in either case. But the sea acted as a strong emetic. Again, as Holtby remarks, this is a misfortune. It would only be an exasperation for another reason, e.g. if you had arranged to met a lover but sea-sickness got in the way. As she also says, Disillusionment and Lies are not cause of exasperation, whereas Book Borrowers and Missing Trains are (she means missing a train, not that the trains are missing, as I first – o tempora! o mores! – read it. Chauvve-Souris, not seen for a while has her entry printed, but as Holtby astutely spots, it wouldn’t be funny without the entrant’s own headings. The winners are Clarence and ‘Fairy’. Holtby says she has collected a neat anthology for herself, and says that Virginia Woolf seems the contemporary writer best fitted to expressions of fury. Woolf, of whom Holtby had written a study, had herself asked Holtby whether she would write an autobiography. 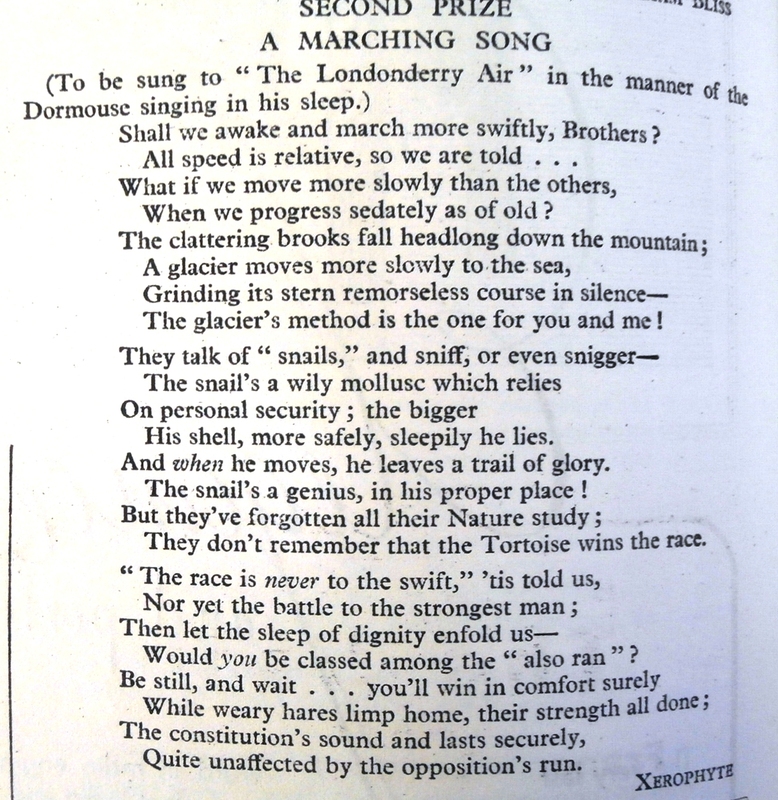 Sylvia Lynd, perhaps with a distant eye (another ten or eleven months) on the General Election, asks for a marching song for the Conservative Party. 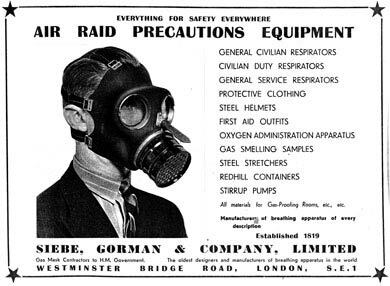 Several songs, she says, should have been sent straight to Pall Mall Chambers (the headquarters of the Conservative Party was The Carlton Club, then in Pall Mall; the club was bombed almost to the ground in October 1940 – with half of the war cabinet there). She suggests they put in for a fiver, rather than the paltry two guineas she has to offer. I am not sure they would have caused Baldwin much loss of sleep. Competitions like this – requiring short bursts of wit, and encouraging a mass response – are always good news for a reader. This is perhaps the first successful one in the competition’s history, barring the first clerihew competition in The Week-end Review (34B). 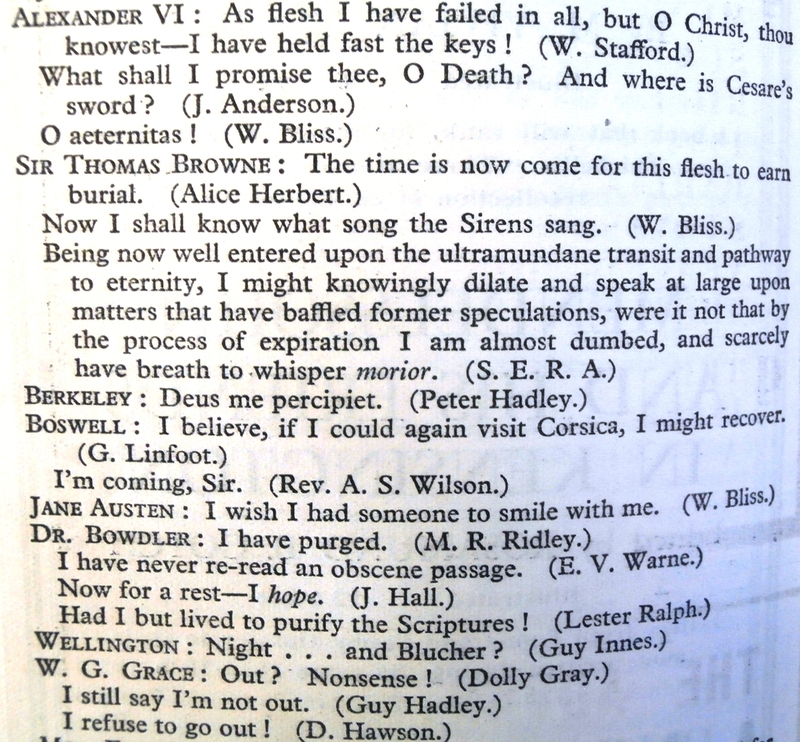 It asks for the best suggested last words for any three of the following: Columbus, Pope Alexander VI, Marlowe, Sir Thomas Browne, Bishop Berkeley, Gibbon, Boswell, Catherine The Great, Horace Walpole, Jane Austen, The Duke of Wellington, Karl Marx, Macaulay, Ruskin, Dr. Bowdler, Mrs Eddy [Mary Baker Eddy], Napoleon III, W.G.Grace, Queen Victoria, Cezanne, Mr. Balfour, Proust, Freud, Al Capone, Einstein, Rockefeller, Hitler and Mae West. Proust and Balfour (a rare instance of a prime minister who subsequently becomes foreign secretary, the other being Alec Douglas-Home – Balfour was held the post in World War One, although his remit did not cover the war) had died in the previous decade – Proust in 1922, Balfour in 1930. Freud, Capone, Einstein, Walpole, Rockefeller, Hitler and West were all living. 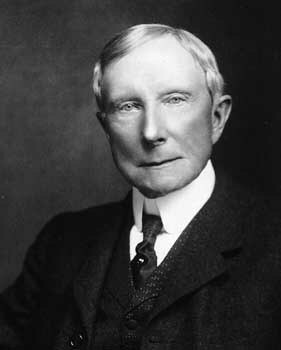 John D(avison) Rockefeller died in 1937 a few weeks shy of his 98th birthday, at which point his worth was over 1.5% of American GDP – a fortune which dwarfs all contemporary fortunes. Capone (only 33 in 1934) was two-and-a-half years into his spell in Alcatraz for tax evasion – he had five years to go. Freud lived until 1939. Walpole died in 1941 (in 1934, he had finished the film adaptation for David Copperfield, a film in which he appears as the tedious sermoniser, the Vicar of Blundlestone). Only Mae West (1980) and Albert Einstein (1970) survived the following decade. West was four years younger than Hitler, and eleven years older than Einstein. The inclusion of Cezanne is a nod towards Mortimer’s taste in painters. Alexander IV was pope from 1492 to 1509 – he was Rodrigo Borcia, the father (by the second of his three wives) of Lucrezia. 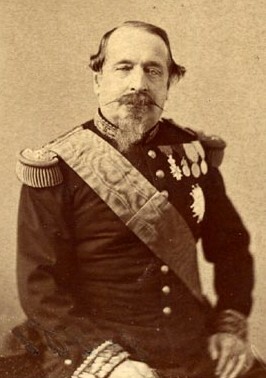 Napoleon III was Napoleon Bonaparte’s nephew, and was both President and Emperor (after a coup d’etat) of France. His widow Eugenie was a friend of Queen Victoria’s; she is to be found (as ‘Ex-empress’) at Windsor in the 1881 census. Perhaps, of all these individuals, Napoleon III is the most lost to history. It becomes clear from the report that Mortimer will be taking this slightly more seriously than (say) Julian Barnes or Francis Wheen in the late 1970s incarnations of the competition. Entrants are rebuked (gently) for forgetting that Jane Austen was a religious woman, for forgetting that Rockefeller was a strict Baptist (besides, Mortimer does not like the entries on Rockefeller or Marx, though we are not told what went wrong with the latter). Macaulay and Gibbon and Cezanne attract almost no entries. 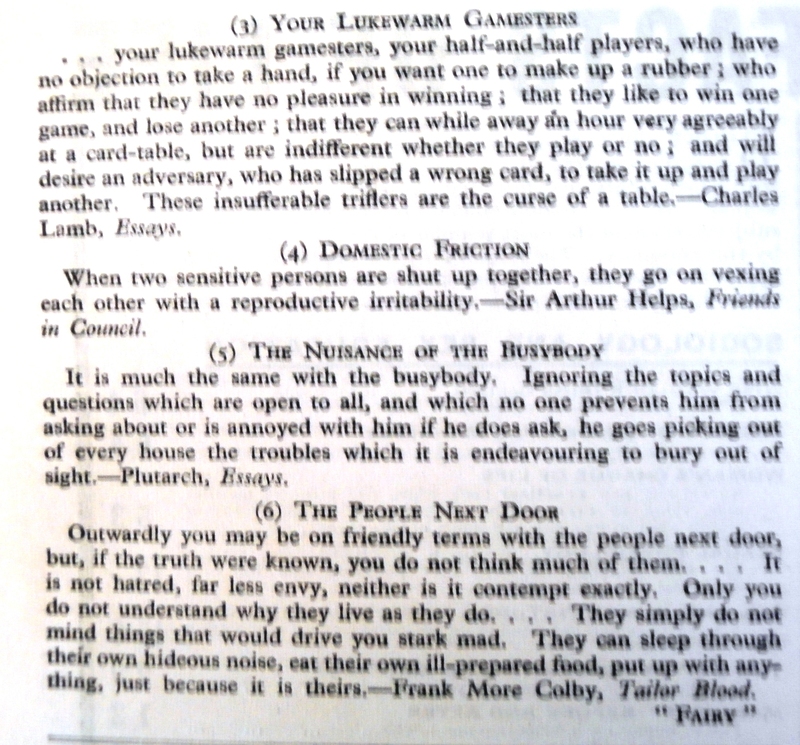 The popular ones are, in order, West, Hitler, Grace, Queen Victoria, Bowdler. The entries aren’t all chucklers! And you can see how stern Mortimer is in his rejoinder to “Magdalen Fillgrave” about Mary Baker Eddy. 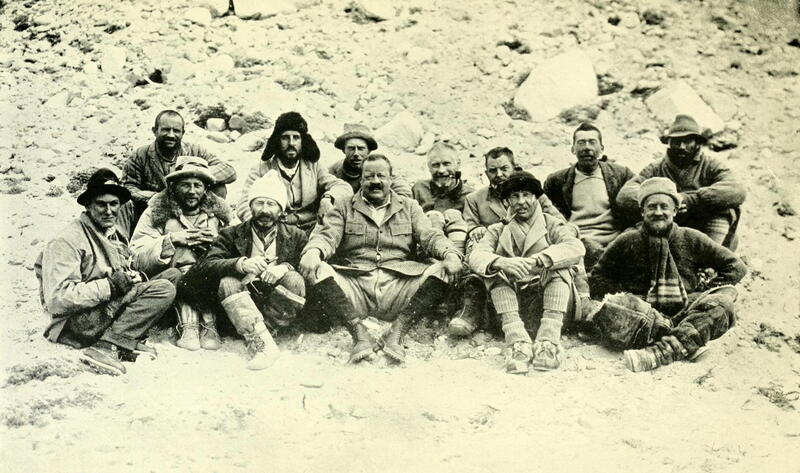 1922 Everest expedition. Somervell is third from right (back row). Mallory is front, row, far left. Born in 1870s, he died in 1956, gaining an MC during World War One in the campaign in Africa. Now for the scoring. Mortimer decides he wants three good ones, entered in one trio (Bliss, as you will see, is much quoted, but from a number of different entries.) 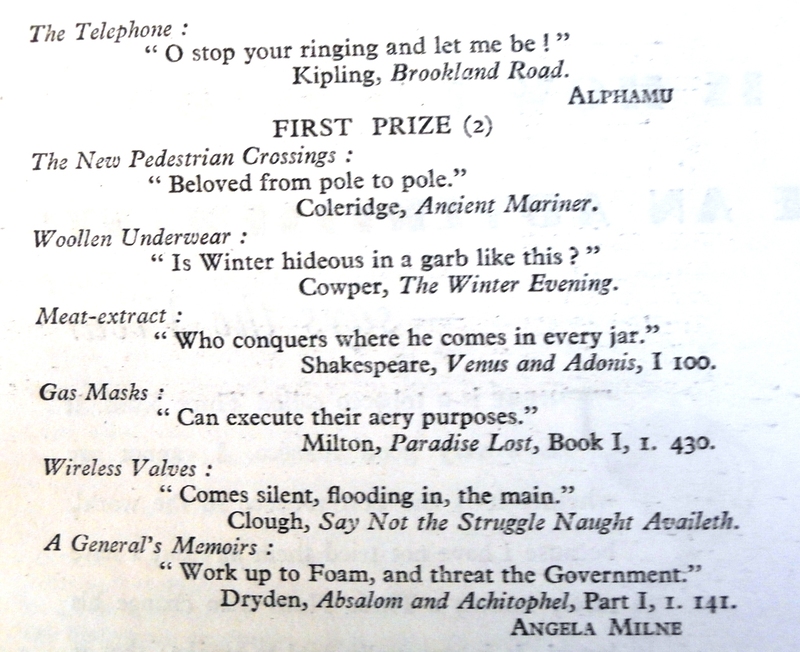 After much toing and froing, H.C. Riddell gets the guinea, and the second prize is divided between Michael Holland – and Michael Holland. I imagine Mortimer being pleased with this complicated little judgment. Is it me, or are these attempts at French and German just not funny at all? John Brophy sets an unusual (and I am afraid, not howlingly successful) competition. He has been stung by an (unnamed) author writing that Greta Garbo is a “puppet” (this is actually a commonplace), and wants a reasoned and specific criticism of Garbo’s skills as an actress in the talkies. By the way, Brophy does not like the shortening of her name to “Garbo”. He sees this as a mannerism borrowed from opera. However, all the contestants call her ‘Garbo’ so he is forced to back down. 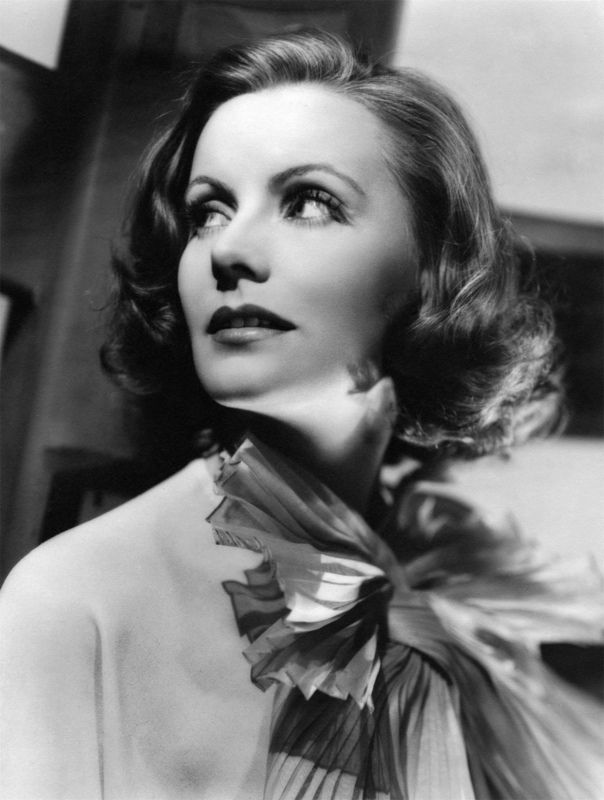 In 1934, Garbo was between Queen Christina and Anna Karenina, and had starred in the indifferently-received The Painted Veil. You can see a little of it here. In fact, she was more or less halfway through her brief career – ten years only – of talkies. Several are congratulated on their discrimination: N.A. Smith, H.C. Riddell, John Skinner, Lester Ralph, Jane Short, Waverley. But the winner is Guy Hadley (there is a runner-up, Touchstone, but his entry is not printed, presumably for reasons of space). Oddly, Brophy admits that Hadley’s prose lacks specifics and originality, but claims it is ‘deftly expressed’. Beg to differ!